Sometimes, all the right things come together. Sometimes fate steps in and you get the right people together at the right location and at the right time and creates something magical, like lightning in a bottle. 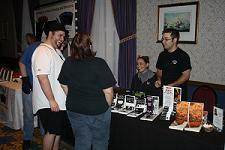 From October 29th – October 31st 2010, the Engen Books staff was present for such an event during the first ever Hal-Con. In a convention so huge and successful that it was covered by Haligonian, Inner Space, The Coast, Eastlink TV and several other news outlets and is being praised as the greatest science-fiction convention Canada has ever seen by those in attendance, Engen Books did its best to make its mark and make it as memorable as possible for those in attendance. Expertly laid out and organized, Hal-Con featured an entire dealer’s room specifically for authors called the Writer’s Corner. This was a convention-long event where fans and fellow writers could come to talk about their work, buy books, and share stories with peers. From the Engen booth both Matthew LeDrew (author guest of honour at Hal-Con and author of Black Womb and Infinity ) and Ellen Curtis ( Compendium, Infinity) were in attendance. In addition long-time friend Kenneth Tam ( His Majesty’s New World ) and Jacqui Tam ( Standing Tall: A Daughter’s Gift ) were in attendance from Iceberg Publishing. Other authors included PJ Haarsma, author of the Softwire series, and Nancy Metzger of Third Person Press. “The Writer’s Corner was awesome,” said Infinity author Ellen Curtis. “It really gave us a chance to interact with people and fans and press on a real person-to-person basis. The main guests of the evening though were Denise Crosby ( Star Trek The Next Generation, Dexter ) and Walter Koenig ( Star Trek, Babylon 5). Other guests included celebrity model Drakaina Muse and Kill Shakespeare author Conor McCreery. The Con was so big that some talent made their way there not as guests, but just to attend. Local comic writer Jay Paulin of Ink’d Well Comics was present in the main dealer’s room and selling copies of he and artist Julie Heffernan’s amazing underground series Messiah. Ken, Matt and Ellen taught their standard panels ( Get Published, Writer’s Toolkit and Writer’s Circle ) to uncommon results. “We always get some attendance, but this was incredible,” said LeDrew. Kill Shakespeare writer Conor McCreery even stepped in half-way through Writer’s Circle to join the discussion. “That’s what these things are all about, connecting with writer’s,” said Curtis. After two days of build, Infinity launched on Sunday, October 31st. (That’s Halloween, folks!) to much applause. The launch featured a reading by Ellen Curtis and Matthew LeDrew to the convention hall, followed by a packed reception including comic writer / journalist Mika McKay ( Freaks with Feelings ) author Nina Munteanu and (there’s that name again) comic author Conor McCreery. 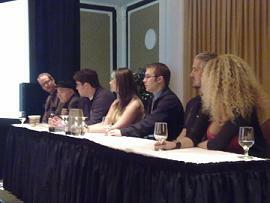 R-L: Conor McCreeny, Walter Koenig, Kenneth Tam, Ellen Curtis, Matthew LeDrew, PJ Haarsma, Drakaina Muse. There simply isn’t enough space to tell all the wonderful stories and things that happened at Hal-Con. There isn’t even enough space to tell the ones that just happened to our authors. Robert S. LePine made a giant replica of Hal’s ship from 2010: A Space Odyssey that spun in the entrance to the con to the awe of all. Engen Books very nearly sold out of every title they had in stock after bringing twice what they normally do to similar conventions. Kenneth Tam battled for the fate of Geekdom in Geeks vs. Nerds celebrity edition… including a surprise phone call from Nathan Fillion himself! Hal-Con surpassed all attendance expectations to the point where one could almost not move in the main suite and reception area. Dr. Who fed Optimus Prime french fries. And most importantly, Jennifer Lambe, Jen Johnston and Amanda Schreiber put off what was not only the greatest event in recent memory, but also the biggest weekend for Engen Books in its brief history.